This image of a bride and groom kneeling at the altar of the Virgin Mary after presenting her with flowers was taken at St. Nicholas Church in November of 2016. Even though you cannot make out much of the couple’s face, the image feels somber and authentic. Everything from their body language, with the grooms hand placed delicately on the bride’s shoulder, their heads bowed down and the way the bride’s hands are folded on the alter depict their respect and reverence for the Virgin Mary. What truly makes this image special, however, is the circular glowing light radiating through the window behind them. Light has been used in countless religious paintings and drawings to depict the holy spirit or some other divine presence, which makes this moment that much more poetic. The light seems to hit the couple in all the right places. 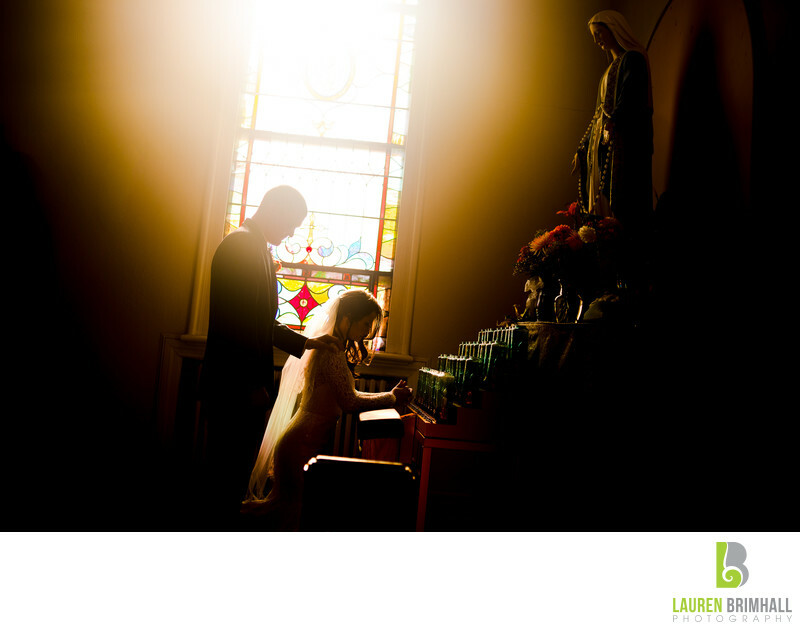 It silhouettes the groom, highlights the curvature in the bride’s form-fitting dress and veil, and offers just a slim highlight on the Virgin Mary herself before falling off into darkness. Offering flowers to the Virgin Mary in church is a ritual that is often exercised in Catholic weddings prior to the final blessing. A typical hymn for this moment would be “Ave Maria,” and many couples find it to be a particularly emotional part of the ceremony as they ask for Mary’s intercession. This particular photograph won a coveted Fearless award in 2017 for it’s near-perfect execution and representation of this sacred tradition. Location: 525 St Louis Ave, Egg Harbor City, NJ 08215.